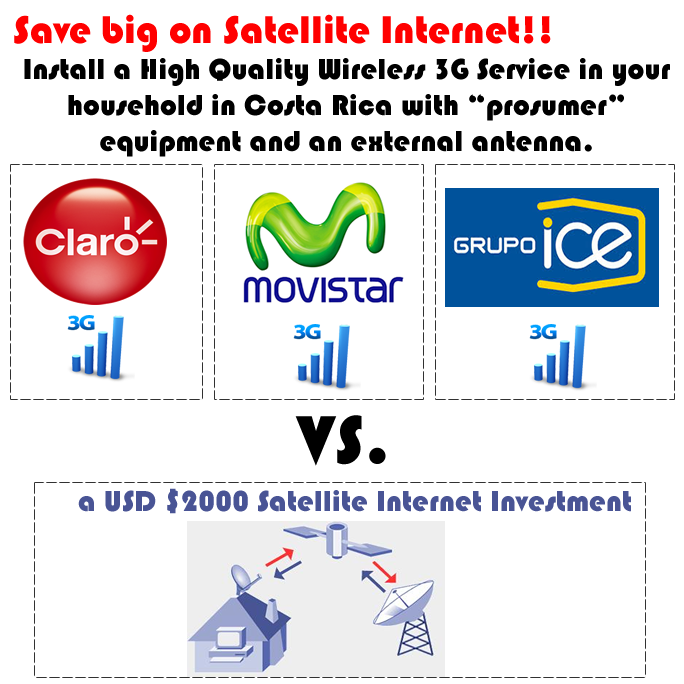 Costly Vsat Satellite Internet VS. a professional installed High Quality Wireless 3G/4G Service in Costa Rica with “prosumer grade” telecom equipment! Before you read this article and send an e-mail, please keep in mind that the first thing that I will ask you is for your GPS location. The following text will describe your need or problem: You live in rural Costa Rica and you want access to a descent/stable Internet connection. There are no “wired-internet solutions” from Internet Service Providers in your area because you are too far away from civilization but you have found out that you can still get a UNRELIABLE 3G/4G wireless Internet connection from Grupo ICE or MOVISTAR (Spanish Multinational Telecom) or CLARO (Mexican Multinational Telecom). So … there is “some” 3G wireless connectivity in your area but you happen to be in the “red spot” of the 3G wireless coverage map (or “MAPA DE COBERTURA”) provided by the 3 telecom companies. 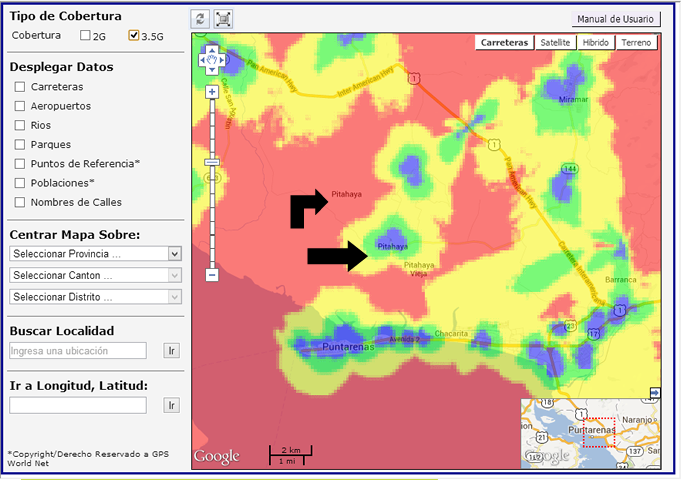 (Grupo ICE 3G Network, Grupo ICE 4G Network , Claro 3G/4G Network and Movistar 3G/4G Network‘s coverage maps in Spanish) The “red spot” on the map is where 3G service is still achievable but it is unreliable. 3G COVERAGE MAP – EXAMPLE. If we keep telling to the world, your “3G Internet horror story” in Costa Rica, you find yourself sometimes waking up in the morning with a 3G service that works fine (you see some connectivity bars) and you are lucky enough to do your things on the Internet. But , then, in the afternoon, around 7pm, you find out that the only 3G telecom tower from Grupo ICE gets hit by thousands of active users with their tablets and smartphones that are trying to “download wirelessly via 3G” the latest Lady Gaga CD Album and you just can’t download a simple text file from an online newspaper. Adding to the problem, don’t forget other natural causes for bad 3G internet reception such as wind, rain (moisture) and mountains. Old VSAT ineffective Satellite Internet is out of the question since you need to invest USD $2,000 for proprietary satellite internet equipment and installation costs. Adding to that financial pain, there is a hefty $200+ per month fee for a slow 1 mbps satellite wireless Internet connection. In contrast to that, you can get 5 TIMES more speed or 5 mbps from Grupo ICE’s 3G network for USD $48 per month. It’s a no-brainer, terrestrial wireless 3G internet service is faster and cheaper. So… you want to keep your wireless 3G service with GRUPO ICE or CLARO or MOVISTAR …but you want make your wireless 3G Internet experience MORE STABLE..!! It is still hard to believe that Grupo ICE, the state-run company was just a few years ago a TELECOM MONOPOLY and as of December 2013, they still carry 85% of all cellular voice conversations and 3G/4G wireless Internet traffic. Therefore, it is safe to say that Grupo ICE’s wireless network is congested or saturated. On the other hand, Grupo ICE has taken some steps in the right direction and it is now truly competing with the other multinationals. Grupo ICE is undoubtedly a telecom mammoth with yearly revenues of USD 1 billion. Movistar and Claro’s Telecom towers are under-used since they are only carrying 15% of user’s traffic needs in Costa Rica as of December 2013. This should be consider as a big hint on where to point your external 3G yagi antenna. 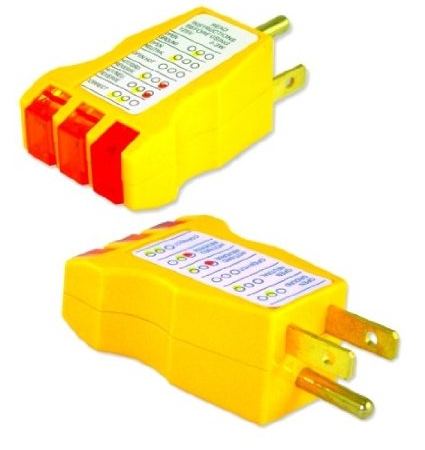 Plastic indoor datacards or 3G USB Modems are not good 3G antennas that can deliver a high quality 3G service. They are cheap and they do their job when you are located in a blue or green spot from the 3G coverage map provided by the 3 telecom companies. But since you are in a red spot, you will definitely need to boost your internet signal by using more “PROfessional-conSUMER grade” or in short “PRO-SUMER” telecommunications equipment, like a 3G Booster and external 3G antenna. Going along the same line of thought, cheap indoor datacards or 3G USB Modems will never perform in the same way as a professional standalone 3G wireless router and the external antenna. Cheap indoor datacards or 3G USB Modems tend to overheat and they have cheap electronics affecting the 3G wireless performance. If you are looking for cheap post-paid data plans to watch hundreds of hours of Netflix over any of the current 3G wireless Networks, you will get a headache in Costa Rica. If you would like to watch video content, then you should consider an “All in English Satellite TV System” since the satellite dish has unlimited bandwidth to transfer video and audio. 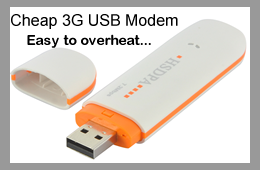 When there is bad weather or it is raining, 90% of the people on cheap 3G USB modems in your surroundings will have a hard time to download anything from the 3G tower, thus this will discourage them to continue using their 3G service and this will stop unnecessary loads to the 3G tower. On the other hand, if you use professional 3G equipment, this will improve your overall data reception because you are creating a professional wireless link between your 3G Router in your house and the 3G tower. So, in short, this means that amateur gear for 3G wireless links is bad and professional gear for 3G wireless links is good. With the 3G equipment, you get a “wireless 3G” landline. You will find in some occasions that having a “wireless” landline is a must in your house or apartment in the mountains of Costa Rica. Your wife/ children/ the maid tend to forget to charge the batteries of their cellphones and you live in a pretty tough environment. You need to make or receive that “health-related” urgent call and your mobile devices keep dropping the calls when it rains or you are doing sales and keep missing important calls. Now. the typical response from someone inside your house is : “Hey, my cellphone never rang…!” But… You can now get it over with, with a professional 3G equipment installation. Our company offers a “pro-sumer” hardware solution to assure that you are getting the best 3G internet service in your area. The idea is to put you in the blue or green zone and get you out of the red zone. With our 2 gateway-3G equipment, you can be miles away from the telecommunications tower and still improve the overall quality of the reception. 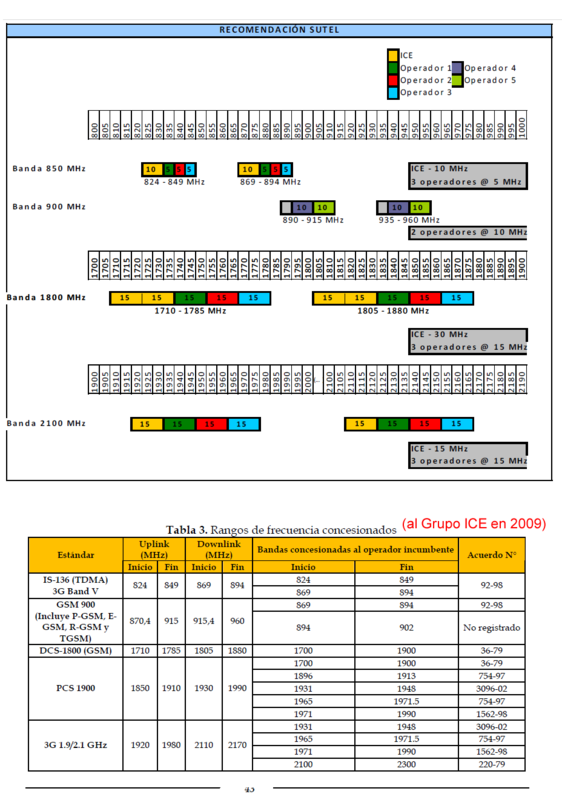 Our equipment includes the following and can be tested against Grupo ICE’s, Claro or Movistar’s wireless 3G network. (To take a closer look at the wireless spectrum from Sutel’s website, click here. It is important to mention that in some cases, we have had disappointed Grupo ICE 3G clients that have remained with Grupo ICE but their problem was solved with the installation of an external 3G antenna. The reason for this is that external 3G antennas are obviously installed outside. With the outside installation and high sensitivity antenna equipment, you are now in a position to “see or scan” more 3G towers close to your location. Now, and since in general 3G towers or 3G cells are “smart”, they can re-route all your 3G wireless bandwidth needs to the least congested 3G tower. Thus, this improves your speed test. 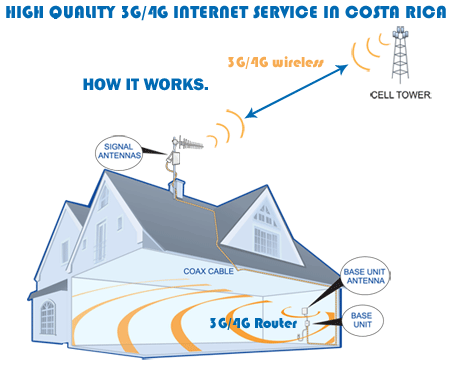 Achieving this in your house is practically impossible since the small indoor antenna inside the plastic 3G USB Modem only allows you to “barely see” one congested 3G tower. Coming back to the inevitable fact of life that if you do something in a professional manner then you get professional results. Also keep in mind that the FOR PROFIT private 3G Telecom companies Claro and Movistar are NOW prioritizing data packets. So if you are prepaid customer paying 0,0085 colones per kbyte (or USD $15.63 per Gigabyte) then your data goes first then “post-paid” customers that have gone over the limits and are getting capped. This makes sense due to the fact that 3G companies are in the business of making money and not giving away bandwidth like socialist 3G Company Grupo ICE. Therefore 6 GB (gigabytes) of data (what a typical 3G consumer will use per month…) at the current “prepaid plan rate” is worth USD $93.78. If you want a high quality 3G speed and you can afford it, please stay on pre-paid and don’t go to post-paid for Claro and Movistar. Also, please keep in mind that if you buy this product from us then all “OUR KNOW-HOW and OUR EXPERIENCE” will be included in our professional 3G equipment installation. Transportation Costs are USD 1 per km driven. TOTAL INVESTMENT RANGE = USD $500 OR … USD $800 OR … USD $1,200 …. For example : You can come to our shop in Ciudad Colón in San José and pick up a fully tested and configured 3G equipment kit for USD $400 and do the installation yourself. If you would like to have second yagi antenna as a backup with its one inch metal post, it is USD $500. USD $500 for a ONE GATEWAY high speed 3G router: CLARO 3G. USD $800 for a TWO GATEWAY high speed 3G router: CLARO 3G AND MOVISTAR 3G + wireless landline. 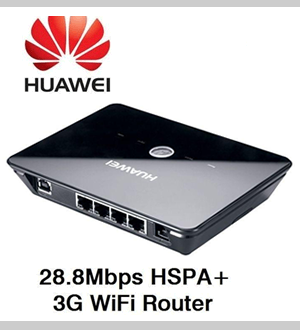 USD $1,200 for a THREE GATEWAY high speed 3G router: CLARO, MOVISTAR , GRUPO ICE 3G + wireless landline. 17 Responses to Costly Vsat Satellite Internet VS. a Professional High Quality Wireless 3G/4G Service in Costa Rica. I was looking at your website and I am interested in your service for providing internet in Costa Rica. We are located in Southern Zone in Ojochal which is about 40 kilometres south of Dominical. We are about 15 kilometres from the highway outside the village and up the mountain. We currently use ICE for our internet on a SIM card in a Huawei or ZTE USB stick and a MOFI 3G/4G/LTE router. The service is supposed to be 2 Mbps and is very slow. Do you provide a service that would be available in our area? 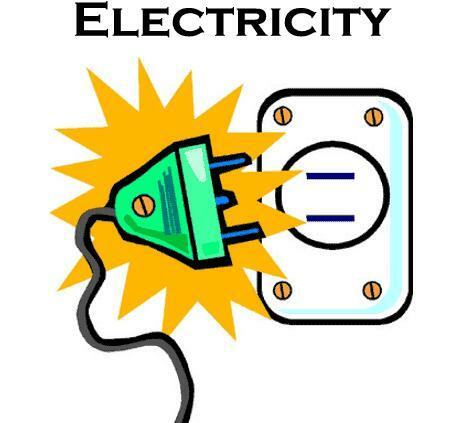 What additional equipment would we need to get fast and reliable service? We have a number of friends who would be interested if your service provides a solution to fast and reliable internet service. (3) The equipment looks as following : External Yagi Antenna, LMR400 Cable, 3G router for USD 600. (4) We will be very happy to accommodate all your friend’s needs. Vivo en Patio de Agua de Coronado y estoy interesada en obtener conexion a internet. Entiendo que seria posible instalar el equipo que ustedes ofrecen aqui en mi casa, correcto? Y el costo de instalacion seria de $700? En esa ubiación podemos instalarle una antena externa para que se conecte a 5 megabits por segundo con un costo mensual de USD $38.40. Is your service available in Mal Pais? If so what is the cost to install and monthly usd charges? Interested in your 3g/4g internet service. I live 1.5 to 2 km south of Matapalo in Guanacaste. I get 3g service from ICE through a data card but have the problems you note on your web site. I want to get the speeds necessary to stream internet tv. Thank you in advance if you have something that will help me. Nececito internet en hermoza , santa teresa (cobano) es posible? cuando y cuanto me costaria? We are building a small home near ElCastell. 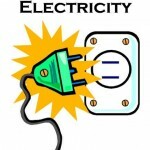 What service can you provide there and how much including installation? and you don’t have a phone number? I live in metro San Jose (Alajuelita) – will your service be better than what I have with ICE? Hi can i get a phone number I want to know if your service is available in Los Angeles Norte San Ramon alajuela plus I would like to know all the information about your service. Estamos entre Marbella y San Juanillo. Podemos obtener 3 a 5 mb? Cual es el costo inicial y mensualidad? La mensualidad se paga a ustedes o directamente al ICE? Tiempo de instalacion? How can I contact you to buy your service?